The Opportunity Zones incentive was established by the bipartisan Investing in Opportunity Act as an innovative approach to spur long-term private sector investments in low-income urban and rural communities. The act establishes Opportunity Zones as a mechanism through which investors with capital gains tax liabilities across the country may receive preferential tax treatment for investing in Opportunity Funds certified by the U.S. Treasury Department. Opportunity Funds use the capital invested to make equity investments in businesses and real estate in Opportunity Zones designated by each state. Opportunity Zone: An Opportunity Zone is an economically distressed designated census tract in which certain types of investments, made through Opportunity Funds (see below), may be eligible for preferential tax treatment. The U.S. Treasury completed the certification of Opportunity Zone designations on June 14, 2018, at which time the four tracts recommended to the Treasury by Gov. Mead were accepted and confirmed. Opportunity Zone designations certified by the Treasury will remain in effect until December 31, 2028. Opportunity Fund: A Qualified Opportunity Zone Fund is an investment vehicle organized as a corporation or partnership for the purpose of investing in Opportunity Zone property. Opportunity Funds are private sector entities required to invest 90 percent or more of their resources in Opportunity Zones. Opportunity Zone property includes stock, partnership interest, or business property in an Opportunity Zone business. More than half of America’s most economically distressed communities contained both fewer jobs and businesses in 2015 than they did in 2000. New business formation is near a record low. The average distressed community saw a 6% decline in local businesses during the prime years of the national economic recovery. The U.S. economy is increasingly dependent on a handful of places for growth. Five metro areas produced as many new businesses as the rest of the country combined from 2010 – 2014. Now is the time to diversify. 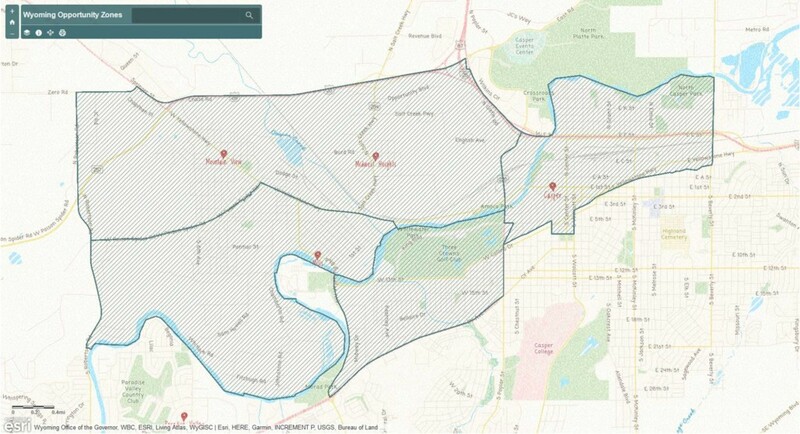 The zones in Casper that were approved (see map below) include the census tract south of Hwy 20/26 to west of Poplar St. to north of W. Yellowstone Hwy and Poison Spider Rd. and east of Robertson Rd. The second tract is south of Yellowstone Hwy and Poison Spider Rd to east of Robertson Rd to north of the North Platte River. The third zone touches the North Platte River on its north side, to the west of Poplar St, to north of CY Ave and east of SW Wyoming Blvd. The fourth zone is the easternmost zone which includes Casper’s downtown area from east of Poplar St to south of the North Platte River to west of S Beverly St. and north of E Yellowstone Hwy and Collins Dr. The Tax Cuts and Jobs Act of 2017 (The Act) provides for the creation of Opportunity Zones (OZ). Opportunity Zones are census tracts that are targeted geographic districts that allows investors to receive substantial tax breaks for investment capital. Investors must invest through newly created Opportunity Funds (OF) or Reinvest capital gains from existing investments to defer/reduce capital gains. The step up in tax basis in the original investment = 10% after 5 years and 15% after 7 years. If held for 10 years or longer, investors permanently avoid capital gains tax on post acquisition gains. Casper was awarded four Opportunity Zones as depicted on the map. 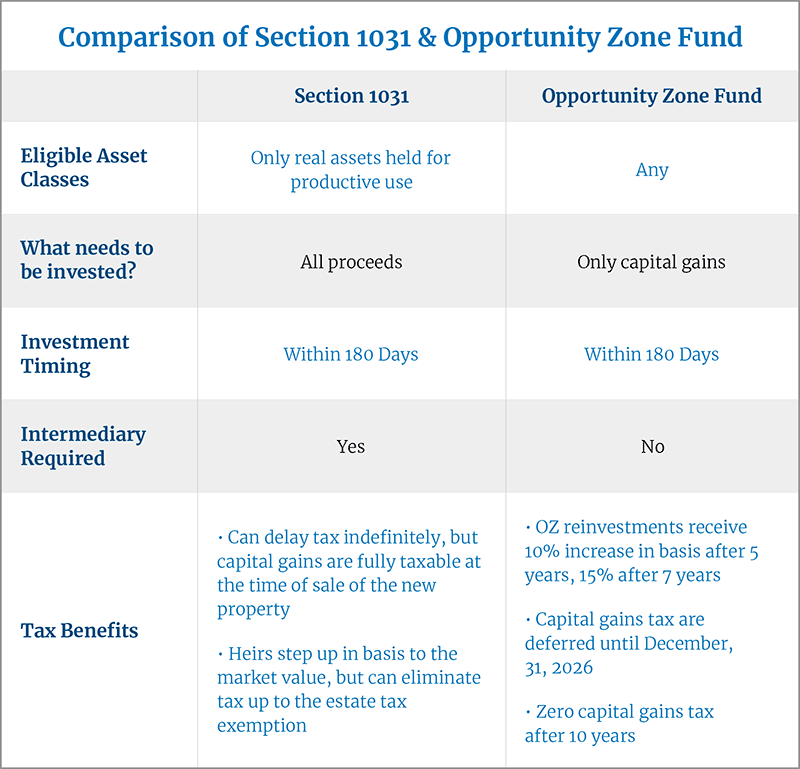 Opportunity Zones are similar to Section 1031 exchanges but there are some important differences as shown on the chart below. Riata Little, VP of Business Development for Energy and Manufacturing, at 307-577-7011 or Riata@caeda.net. Sabrina Foreman, VP of Business Development for Medical and Finance, 307-577-7011 or Sabrina@caeda.net.